Until recently, I thought old folks only had black-and-white pictures. Rarely do you see colorized versions of these photos, especially those from the 19th century. And if you do, they are usually the modern Photoshopped versions, not the authentic ones. So it was with great surprise when I recently came across with a gem of a book called “Color Photos of America’s New Possessions.” Frank Tennyson Neely, a former schoolteacher who operated a publishing business in America, released the book to the public in 1899. It was reprinted the following year. You probably have seen some of these photos already, but not with vibrant colors. And that makes this photo collection special: the natural colors make the pictures more real, bringing us back to the year 1899 when the Philippine-American War was in its earliest stages. 1. Estero de la Reina. 7. Bahay-Kubo (Traditional Filipino House). 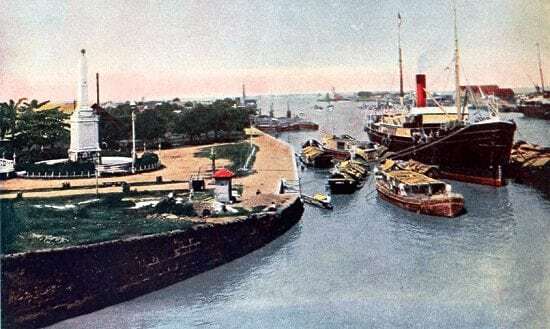 As you can recall, Manila of the 1890s was fondly called by some writers as the “Venice of the Orient.” This is because of the city’s picturesque canals, which include Estero de la Reina along Calle Tetuan. 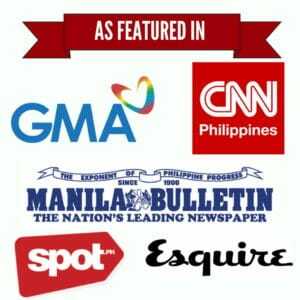 Also Read: Whatever Happened To Binondo’s Lift Bridge? 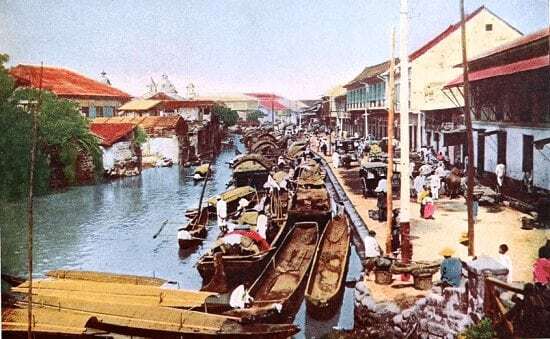 The canals back then kept commerce alive by allowing boats to travel and transport goods throughout the city. I wonder what our ancestors would feel when they see Estero de la Reina today. What was once a place teeming with life is now a creek so filthy even rats wouldn’t dare swim on it. 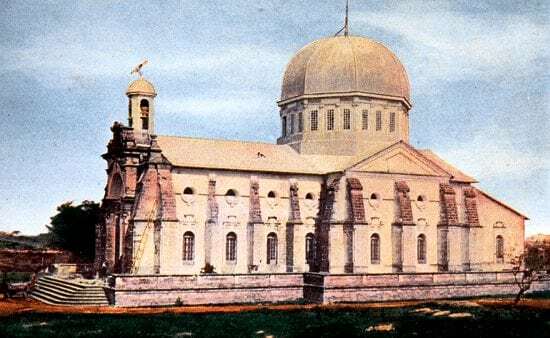 The Americans were probably in awe when they first saw the San Sebastian Church only a few years after its completion. Declared a minor basilica by the Augustinian Recollects, San Sebastian is the only all-steel church in the country. Spanish architect Genaro Palacios reportedly designed it after the gothic cathedral in his home country, while no less than Gustav Eiffel (the engineer behind the world-famous Eiffel Tower) joined the team who conceptualized the steel structure. Today, the church is being eaten by rust as a result of water leaks, but ongoing restoration will hopefully reverse the damage. But whoever said that had no clue what he’s talking about. The Anda monument was built in 1871 in honor of Simon de Anda y Salazar, who, after successfully leading the resistance against the British invaders, was appointed governor-general of the Philippines. The original monument (as seen in the photo) was erected near the mouth of the Pasig River. It suffered serious damage during WWII. Later in the 1960s, it was reconstructed and transferred to another location to give way to the construction of the Del Pan Bridge (now Roxas Bridge). For years, it served as the centerpiece of the Anda Circle along Bonifacio Drive and was later blamed for causing traffic congestion. In 2014, DPWH has had enough and decided to replace the circle with a road intersection and transfer the monument to the Maestranza Park in Intramuros. 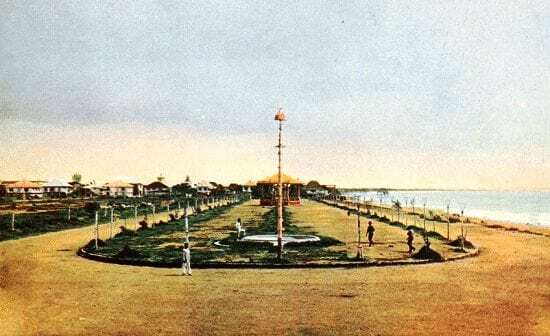 Luneta was such a big deal back in the day, so much so that Manila’s elite frequented this place to have their afternoon strolls and evening social activities. The area was formerly a marshy patch of land which, in 1820, was transformed into Paseo de Luneta overlooking Manila Bay. The 19th century Luneta not only served as a leisure park but also execution ground where rebels and mutineers met their fate. When Uncle Sam took over the Philippines, much of the transformation took place in its city capital. 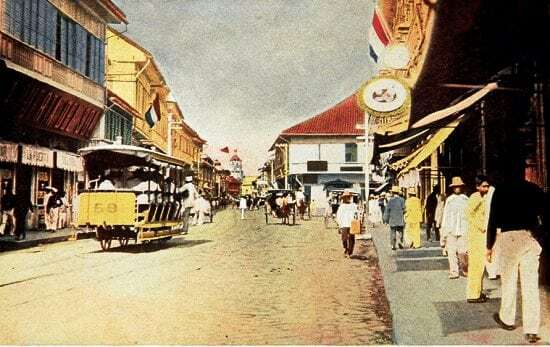 The center of commerce gradually moved from Binondo’s ‘Chinatown’ to an area bounded by Plaza Santa Cruz, Escolta, Plaza Goiti, and Avenida Rizal. The Manila’s elite frequented Escolta to shop inside upscale department stores such as La Puerta del Sol (see photo above) and Estrella del Norte; watch movies at Lyric and Capitol theaters; and buy expensive goods from luxury boutiques such as Rebullida (Swiss watches), Riu Hermanos (leather products), and Pillicier (imported fabrics). 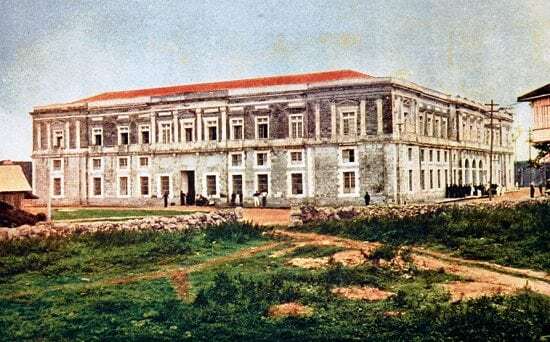 The pre-war Aduana later became home to different offices: Casa de Moneda (Mint), the Customs, and the Intendencia General de Hacienda (Central Administration). After sustaining significant damage during the Liberation of Manila, the building was reconstructed and once again housed government offices, including Commission on Elections. In 1979, a huge fire destroyed the building. Soon thereafter, Presidential Letter of Instruction No. 966 was released to have it restored and become the future home of the National Archives. As of this writing, the restoration project is still ongoing. 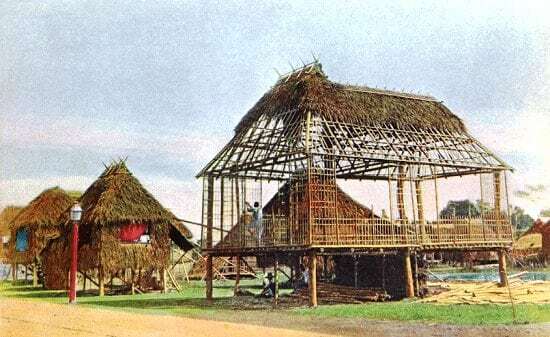 This photo shows how a traditional Filipino house, known as bahay-kubo (nipa hut), was constructed in the late 19th century. Little has changed since then, but variations of the native Filipino house have been developed in other parts of the country, where people build their dwellings based on their existing culture and climate conditions. Cockfighting is to the Philippines as bullfighting is to Spain. It became a favorite national pastime in the 18th and 19th centuries, so much so that the Spanish colonial government imposed taxes to regulate it. As a result, it became a lucrative source of income for the colonizers, and it remained so until the arrival of the Americans. When Uncle Sam started penetrating the Filipino society, cockfighting became one of its targets. In fact, the American government went as far as including morality lectures in the primary school curriculum just to prove to the natives how barbaric their customs were–cockfighting included. Bonus Trivia: Cockfighting has been a favorite Filipino sport since time immemorial. And it’s even older than most people think. 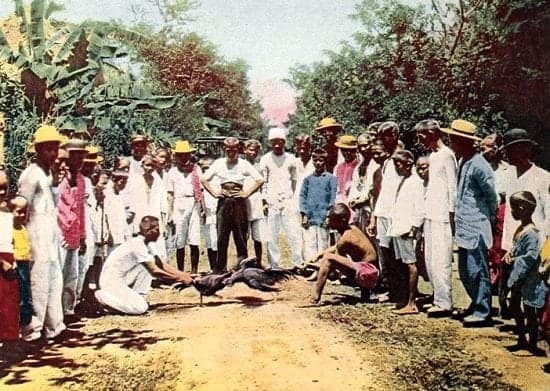 According to the book “The Cockfighting: A Casebook” by Alan Dundes, an early form of cockfighting was recorded in Butuan before the Spanish colonizers arrived. 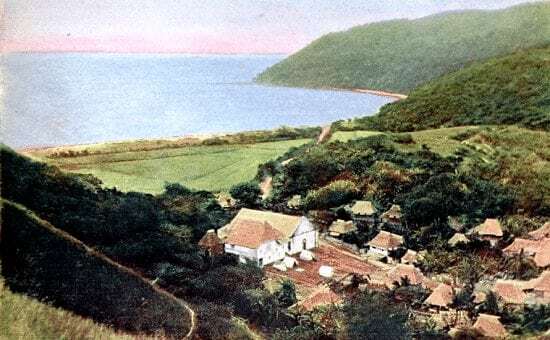 The same thing was witnessed in Palawan by Antonio Pigafetta, the famed chronicler who joined Ferdinand Magellan in a journey around the world. You’re looking at a photo of Corregidor years before the Americans turned it into an island fortress. They wanted to build strong defenses in the area shortly after declaring the Philippines as their new territory in 1899, and they chose Corregidor as their headquarters. In 1942, Corregidor Island fell into the hands of the invading Japanese army. Three years later, the Allied forces came back to reclaim it and all the other island fortresses. The Barasoain Church in Malolos, Bulacan had rough beginnings. The original church, made of light materials, was engulfed by fire in 1884. But shortly after its reconstruction, Barasoain became an important landmark that saw the rise and fall of Aguinaldo’s government. 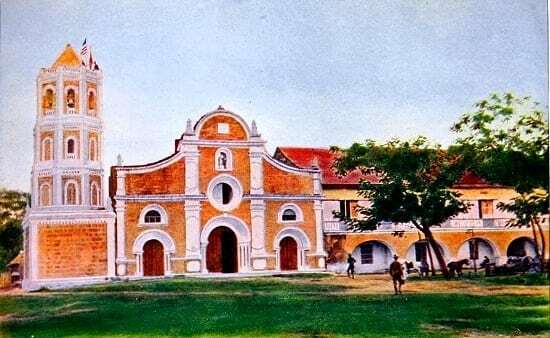 It was in 1898 when the constitutional convention was held in the church, followed by the proclamation of Malolos as the new capital of the Philippines. A year later, the newly-established First Philippine Republic made Emilio Aguinaldo its president. The photo above shows the church during the first day of the American occupation. 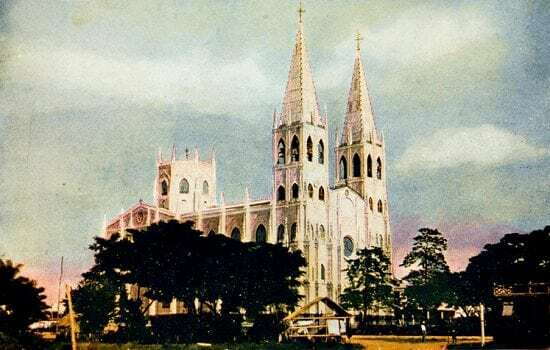 After Aguinaldo and his men left, Gen. Arthur MacArthur made the church his headquarters. Soon after seizing control of La Loma on February 5, 1899, Brig. Gen. Arthur C. MacArthur made its church his new headquarters. He and his men, the Second Division of the Eight Corps, stayed here as they prepared their strategies for the Battle of Caloocan that would take place a few days later. In the end, the Americans won the battle. As for Gen. Luna, their defeat opened his eyes to the deficiencies of the Filipino army and prompted him to open a military academy to help correct those mistakes. Filipinos have always believed in the afterlife, and our practice of burying the dead reflects that. When the Spanish colonizers arrived, our ancestors were introduced to the idea of a cemetery. Its Filipino translation, sementeryo, came from the Spanish “cementerio” or also known as “kampo santo” (a combination of “campo” or field and “santo” or saints). 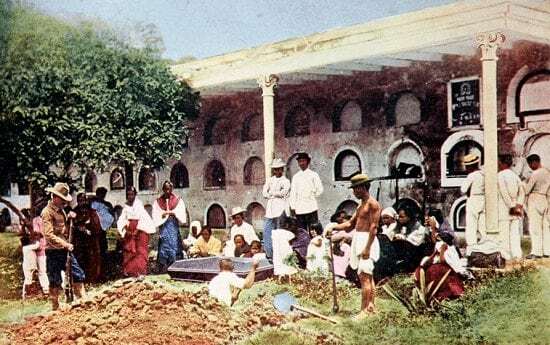 Up until the 19th century, Filipino Catholics were usually buried within the church grounds, while important personalities were interred inside the church. A usual feature of cemeteries, like in the old Paco cemetery, was the required rental fee. Coffins placed inside the niches or “cubby holes” were removed as a consequence for not paying the fee. The remains were either left in the open or placed in a vault below. Berhow, M. (2012). American Defenses of Corregidor and Manila Bay: 1898-1945. Osprey Publishing. Color Photos of America’s New Possessions. (1899). Chicago. Dundes, A. (1994). The Cockfight: A Casebook. Univ of Wisconsin Press. Hedman, E., & Sidel, J. (2005). Philippine Politics and Society in the Twentieth Century: Colonial Legacies, Post-Colonial Trajectories. Routledge. Silbey, D. (2008). A War of Frontier and Empire: The Philippine-American War, 1899-1902. Macmillan. Taft, H. (2004). Recollections of Full Years: (Annotated). Big Byte Books. ← TEST YOURSELF: Can You Recognize All 33 Of These Pinoy Historical Events?